The boom in the production of horror films in Japan at the end of the last millennium didn’t take long to degenerate into cliché, convention, and predictability. The Kaidan or avenging spirit motif had long been a staple of theatrical modes of address and had popped up sporadically throughout Japanese film history. But by 2000 I for one was sick of long haired phantoms exacting their revenge through modern technology. With the benefit of hindsight one can now see how few moments of originality there were. Even the South Korean examples were rarely anything other than pallid imitations. This makes Uzumaki all the more exceptional. There is a genuine spark of inventiveness and creativity in director Higuchinsky’s handling of Junjo Ito’s manga source material. This was Higuchinsky’s directorial debut and he brought to his feature films a visual sensibility honed from a career producing music videos. 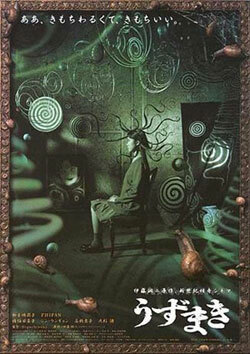 The premise of Uzumaki is that the small Japanese town of Kurouzucho is being slowly taken over by spirals. 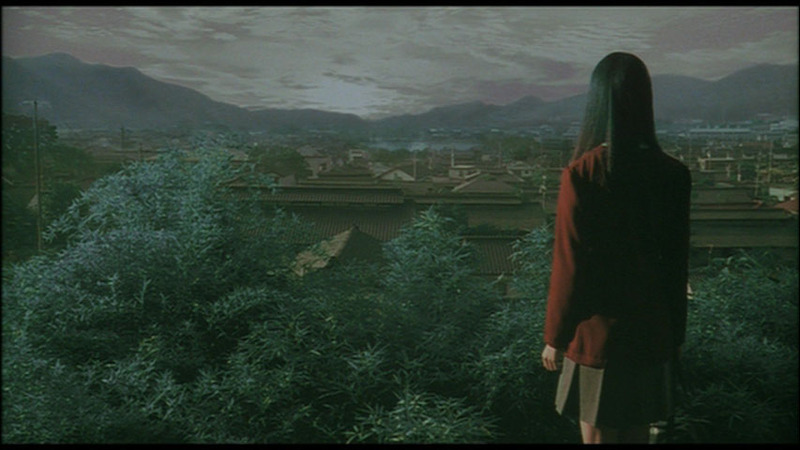 This naturally makes for an incredibly weird experience, but the screenplay by Takao Nitta and Chika Yasuo situates the odd narrative within a recognisable framework; a high school, teenage protagonists, an isolated community. But from the offset Higuchinsky employs a lot of formal trickery to indicate that this is a world turned upside down awaiting an apocalypse. The colour pallette is bathed in greens and yellows offering a visual indication of the sickness and obsession that is controlling those characters preoccupied with spiral patterns. The filmmakers make use of snails, tunnels, clouds and vapours, a cracked windscreen, the drum of a washing machine, and most memorably a teenage girls hair to indicate the encroachment of a spiral apocalypse. The plot likewise has a circularity, and the director regularly employs 360 degree pans and circular movements with his camera. 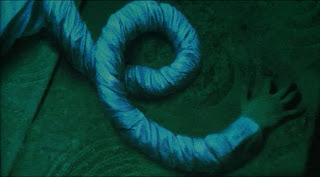 Part of the pleasure of Uzumaki is looking out for the spirals. The only characters able to separate themselves from this odd turn of events is schoolgirl Kirie Goshima (Eriko Hatsune) who lives in a single parent family (although very little is made of this) and Shuichi Sato (Fhi Fan) a studious bespectacled young man who endures seeing both of his parents claimed by the spiral curse. If the film has anything to say other than the end of the world is nigh, then it might centre on the fact this is a world without effective parental figures. The clichéd high school set up is given a novel twist when pupils transform into giant snails and start climbing the walls, and the screenplay attempts to develop a backdrop of myths and ancient legends that centre on a lake, though this angle remains obscure and underdeveloped. An investigation by journalist Kyoko Sekino (Hinako Saeki) leads only to his death as the film seems determined to offer no explanation for the events. Depending on your view this is a strength or a weakness. At times Higuchinsky’s visual flair falls down flat with unconvincing CGI, but this is more than made up for by some gruesomely comical special make up effects. The sense of apocalyptic doom walks hand in hand with absurdist comedy creating an uneven tone, but the oddball plot always retains interest and intrigue. The movie will inevitably face charges of style over substance, and it is fair to say that as a story it is dismal failure, but this remains a major contribution to the apocalyptic subgenre because of the audacity of its premise and the manner in which the filmmakers bring life to it.